A Quote-Lead, follow or get the hell out of my way. Astrogation:4D+1, Starship Shields:4D+2, Starship Gunnnery:5D, Laser Cannon:6D+1, Proton Torpedo:6D+1, Starfighter piloting:5D, SP:Viper:6D, Sensors:4D+1. Colonial Laser Pistol: 5D Damage, Range: 3-10/30/120, sealed flight suit, comlink, Medpac, Colonial uniform, toolkit, Viper fighter. 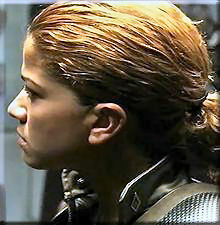 Virtually nothing is known about Katraine, other than she is a one of the elite Viper pilots for the Galactica.